Displaying a polished look that will blend well with a variety of styles, this transitional TV console will blend right in with your existing decor. 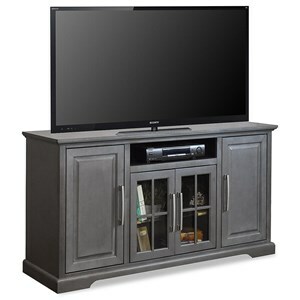 This TV stand offers the storage solution you need in your home with four cabinets including two with glass doors to show off your favorite items. 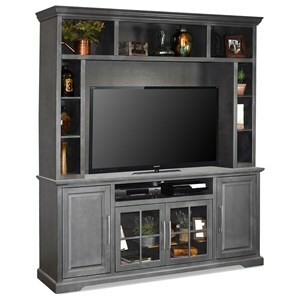 Complete with a neutral grey finish, this TV console will be a great addition to your living room. The Ironwood Transitional 78" TV Console with Glass Doors by Legends Furniture at Home Collections Furniture in the Denver, Aurora, Parker, Highlands Ranch, Castle Rock, CO area. Product availability may vary. Contact us for the most current availability on this product. Browse other items in the Ironwood collection from Home Collections Furniture in the Denver, Aurora, Parker, Highlands Ranch, Castle Rock, CO area.